A new proposal could lead to a nuclear power plant in the UK that literally shoots rainbows into the sky. 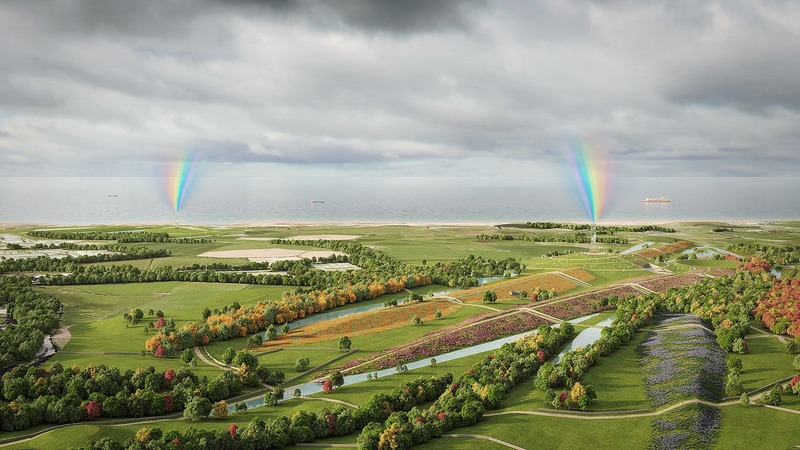 UK-based master planning firm, One Creative Environments, submitted a landscape design proposal for Cumbria’s Moorside Power Plant that is equipped with two large glass towers that would use light and mist to create a continual arching rainbow over the site. The Moorside Power plant is slated to be completed in Cumbria’s rural landscape in 2024. A creative design competition, sponsored by the Royal Institute of British Architects (RIBA) and the Landscape Institute, called on designers to submit creative landscape proposals for the project. One Creative Environments’ rainbow pitch, called Discovery Park, was recently shortlisted along with four other design firms. The company’s submission envisions a master landscaping plan that would seek to integrate the power plant into the area without sacrificing the existing landscape’s beauty. The proposal calls for using 13 million cubic meters of excavated earth to form a green-covered hillscape, which would be sculpted into various earthworks shaped into representations of splitting the atom, energy and particle trails. An outdoor science park would house educational activities and science exhibitions, and a large, open-air amphitheater would host concerts throughout the year. However, the cherry on top of the design is clearly the massive man-made rainbow that would arch over the landscape. 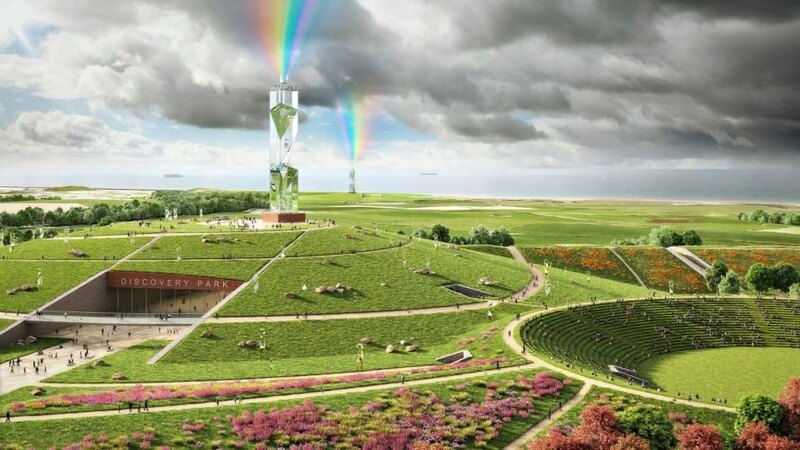 Two large glass prismatic towers would be placed on opposite sides of the project and would use light and mist to create a continual rainbow. An onsite plant nursery would produce “floristically-rich grassland habitats” that would echo the colors of the rainbow on the ground. According to the designers, the rainbow installation was inspired by a William Wordsworth poem remarking on the beauty of Cumbria, “My heart leaps up when I behold a rainbow in the sky”. A new proposal could have a nuclear power plant in the UK shooting literal rainbows in the sky. UK-based master planning firm, One Creative Environments has submitted a landscape design proposal that envisions Cumbria's Moorside Power Plant equipped with two large art sculptures that would use light and mist to create a continual rainbow over the site. 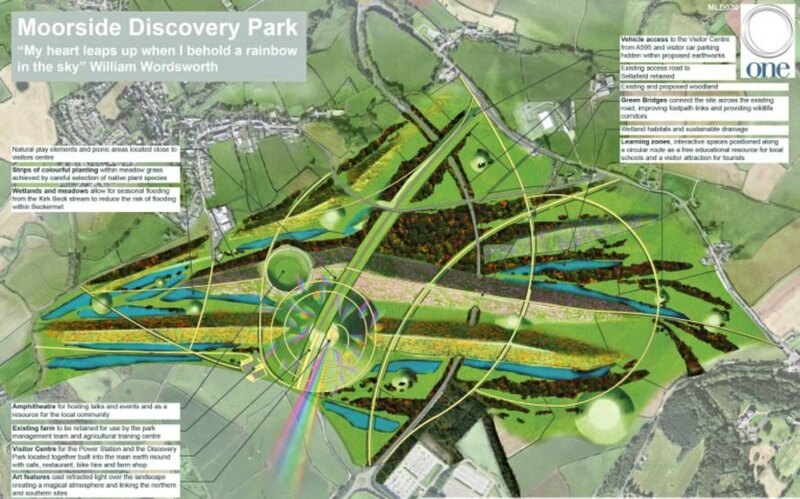 The Moorside Discovery Park proposal includes a massive, man-made rainbow arching over the site. The Moorside Power plant is slated to be completed in Cumbria's rural landscape in 2024. A creative design competition, sponsored by the Royal Institute of British Architects (RIBA) and the Landscape Institute, called on designers to submit creative landscape proposals for the project.